Stretch fabrics are one of the newer inventions in workwear – and the users are very excited about workwear with stretch that offers freedom of movement in a completely new way. MASCOT has further developed on the stretch trend with this waterproof and 100% four-way stretch jacket (17001); the perfect protection against winter weather. The combination of properties in the specially developed fabric is what makes this jacket extraordinary. The waterproof material (certified according to EN 343) stretches in all directions to offer increased freedom of movement in all work situations. The material is constructed in a very durable polyamide fabric quality that ensures that the jacket lasts winter after winter. Another special property of the material is its low weight. The developers have succeeded in integrating waterproofness, durability and stretch integrated into a material weighing only 200 g/m2. Overall, you get a lightweight jacket that is very flexible and easily follows your every move. 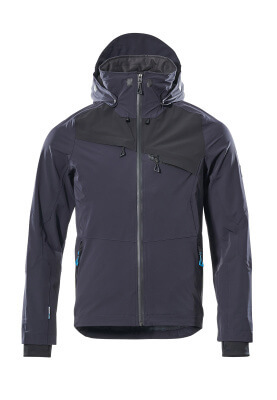 The jacket has a very thin lining making full use of the lightweight outer material. The jacket also has all the necessary details for a busy day: Detachable hood with adjustable drawstring, inner pocket with zip, chest pockets and front pockets with zip, adjustable elastic drawstring at waist and thumbholes at the cuffs. The jacket can be found in the MASCOT® ADVANCED workwear range and is available in five different colour combinations including dark petroleum/black and dark navy/black. The jacket is available in sizes XS-4XL. The same jacket is also available with a lightweight CLIMASCOT®-lining (17035) in the colours black and dark navy.